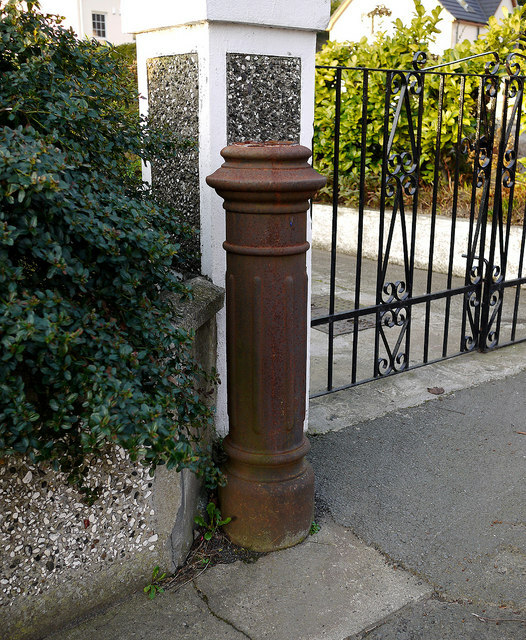 What I think is the remains of a cast iron sewer vent pipe outside a house on the Donaghadee Road in Newtownards. It is marked "Adams Ltd. York". See SO8999 : Sewer Vent Pipe - Henwood Road for a complete example (which is also listed). I can't find too much out about Adams Limited, but they appear to have been involved in the water and sewage treatment industry and may still be trading as Ham Baker Adams / Adams Hydraulics - Link . Clarifications on the above welcomed. See also J4974 : Sewer vent pipe, Newtownards.